If you’re planning or about to plan a sweet sixteen party, you’re most likely trying to figure out a fun sweet sixteen theme. Fortunately, there are literally countless options! If the birthday girl doesn’t want to go too specific, there are some classic sweet sixteen themes that are always on point. Read below for some favorites! A fairytale or “princess” sweet sixteen theme is especially fun for the birthday girl because she can wear an extravagant, quinceañera-style dress. There can also be fancy dances incorporated, or maybe the birthday girl can sing her favorite song from a Disney film. 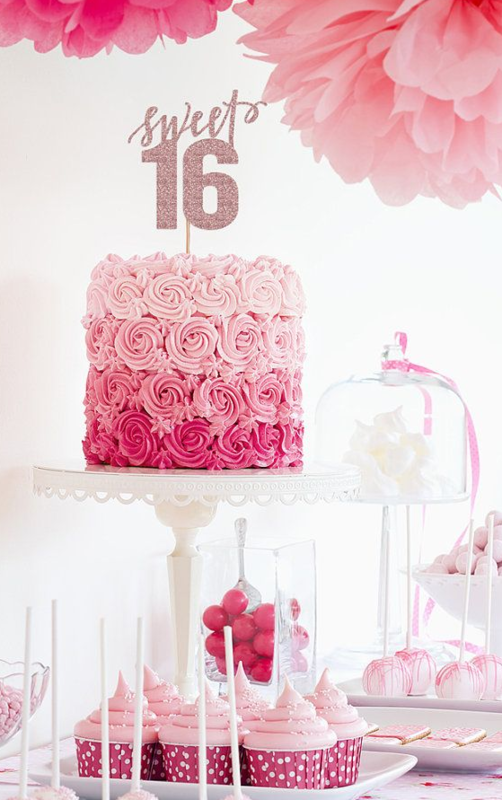 A fairytale sweet sixteen theme opens up lots of great ideas for décor as well! As one of the most popular sweet sixteen themes, “beach” has lots of room for creativity. From the décor to photo booth ops to attire to catering (crab cakes and shrimp tacos! ), there are limitless choices to make the birthday girl smile. This theme can also be called “Red Carpet” or “Celebrity”, and is one of the most popular for sweet sixteen themes. The birthday girl and her guests can dress to the nines to either look as glamorous as a star, or simply dress up like an existing celebrity. There are fun ideas such as a red carpet photo booth, fake champagne, and hired paparazzi (i.e., the hired party photographer). One of the most visually fun sweet sixteen themes there are! A glow party means that guests get to adorn themselves in glow-in-the-dark apparel or accessories. This will look great in video footage when everyone is dancing. 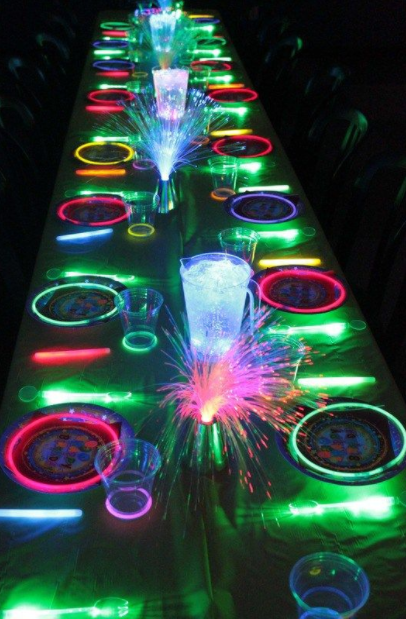 There’s also amazing options for catering, including glow-in-the-dark glasses, plates, and even cakes! A sweet sixteen theme that’s basically an excuse to dress up, “Dress to Impress” has been around for decades. It’s straightforward, but you can still have fun with décor and catering. Anything fancy goes! Mmmm! Teenagers love this sweet sixteen theme. Décor can be extra fun too, with colorful oversize ice cream cone piñatas, lollipop bouquets, or a big chocolate fountain. Candy stations and dessert bars will pump everyone with enough sugar to dance their hearts out! If your daughter is a cinephile, a movie sweet sixteen theme may be the right way to go. Guests can be served popcorn and other movie theater treats, you can have a red carpet for photos, the birthday girl can sit in a director’s chair, you can have Oscar stature centerpieces, and guests can come dressed as their favorite movie character. This is another sweet sixteen theme with lots of room for creativity! This is a really fun sweet sixteen theme. The birthday girl and her guests wear pajamas and eat “sleepover food” like pizza, cookies, popcorn, s’mores, ice cream, and peanut butter and jelly fries! (Yes, those exist.) At least you’ll know everyone is comfortable, right? A great sweet sixteen theme for the catering alone, Mardi Gras has been a favorite for years. And why not? Guests can wear fun Mardi Gras masks, the décor can incorporate lots of feathers, beads, and fleur de lis, and the music will be amazing! A classic! What could be sweeter than pink for the birthday girl? For this sweet sixteen theme, she can wear pink, eat pink food, have her guests wear pink, and be surrounded in pink balloons, pink streamers, and pink confetti. Bright colors, fresh party food, refreshing drinks, pineapples and tropical flowers everywhere, fun outfits, Hawaiian music: a luau sweet sixteen theme is always a blast and makes for great photos! 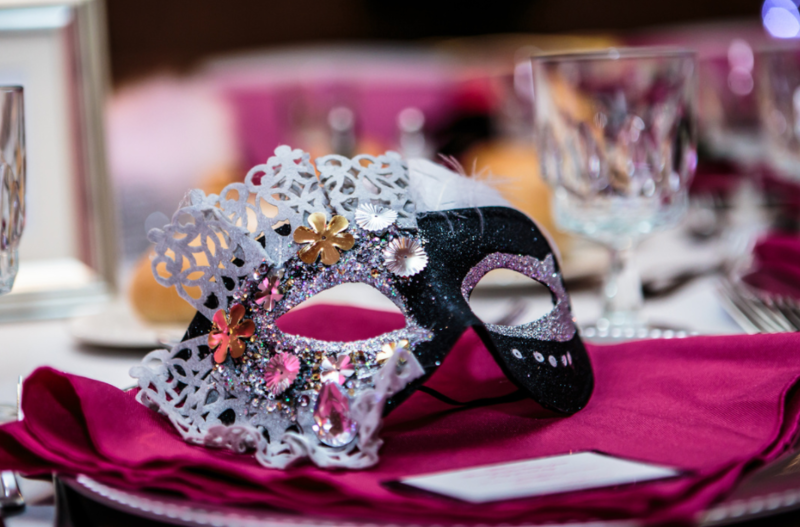 Another one of the most popular and long-running sweet sixteen themes, a masquerade allows guests to wear masks and wear dramatic party attire. Mocktails and fancy décor are usually the hallmarks of this theme, as well as a few “grown-up” style dances. Bust out your inner Saturday night fever and get down with a disco sweet sixteen theme! The DJ can play new music, but can incorporate 1970s tunes to keep the theme stayin’ alive! Girls can wear shiny disco dresses, and the guys can wear platform shoes and wide collars. And of course, with disco and the 70s, there are countless options for décor! Hopefully these suggestions give you some great ideas for sweet sixteen themes. And if you’re looking for the perfect party venue for a sweet sixteen, check out our photo gallery! As one of the best banquet halls in Los Angeles, Hollywood Banquet Hall has hosted many unforgettable events. Feel free to contact us with any questions if you’re interested in hosting with us, or check our availability.